Three years have passed since the Great East Japan Earthquake and the Fukushima Daiichi Nuclear disaster, which have left 15,886 people dead and 2,620 people still missing. Buildings and streets have been restored; businesses and hotels have reopened; and the government has been encouraging residents to return to Fukushima after the decontamination work is done. From the outside, it appears that things are getting back to “normal” by seeing it from the outside, but a child advocate and former elementary school principal in Fukushima, who has seen the changes since the disaster, said otherwise. 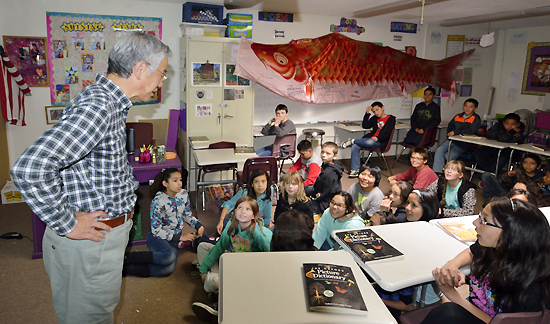 In an interview with The Rafu Shimpo, Shishido shared his first-hand experience of protecting his students in the wake of the disaster as well as his ongoing efforts to give children a chance to enjoy outdoor education in a clean, safe environment. After the disaster, all the windows remained closed on campus. Outside activities were banned. Shishido and an assistant principal decontaminated the school buildings everyday with a pressure washer. Children were forced to wear long sleeves and surgical masks to protect themselves from invisible radiation. Smiles were fading away from their faces. The school superintendent in Date city, Kenichi Yuda, was concerned about physical and emotional effect on children. He proposed an idea of “traveling classrooms,” which would allow children to have outdoor experiences in safe areas outside of Fukushima Prefecture. 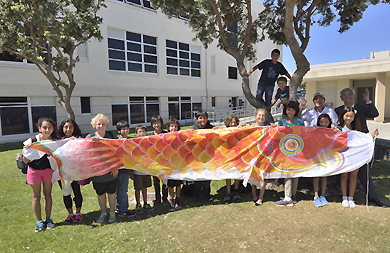 Shishido, who understood the educational benefits of field trips and outdoor learning even before the disaster, helped Yuda implement the program. After only six months, nine schools out of a total of 21 schools in Date city were able to send fifth and sixth graders to schools outside of Fukushima for a few days. Seven students from Shishido’s school visited Niigata Prefecture located about 100 miles west of Fukushima. The program created positive outcomes for the participating children. Students from both schools studied in the same classroom, had school lunch together, and enjoyed exercising on a school field. After school, they went to the beach and engaged with nature, which weren’t allowed in Fukushima. According to Shishido, the negative atmosphere has been rampant among people in Fukushima lately. Since the mechanical damage has been largely restored, the government has been emphasizing that everything is back to normal. “That has created pressure for people not to show any concerns or uncertainty,” he said. A report says that a total of 180,000 people relocated from their hometowns to other cities in Fukushima after the disaster. Forty thousand people left Fukushima, but 6,000 have come back. The government sees the number of returning residents as a positive sign saying that they came back to Fukushima because of the intensive decontamination work. But when Shishido talked to parents, they told him different stories. “People who currently live in Fukushima are the ones who could not evacuate due to their financial or employment issues. Some people whose husbands worked in Fukushima had no choice but to leave their husbands behind. But many could no longer live separately, so they came back,” Shishido said. “Everybody is under stress. Nobody knows for sure what kinds of health issues might surface down the road regarding radiation exposure. But if there is even a slight possibility of future health problems for local people, then the government should at least give choices to Fukushima residents about whether to stay or evacuate. 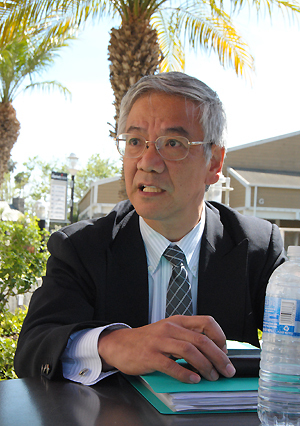 And those who choose to evacuate, they should be compensated,” Shishido affirmed that what they need is a support system. A research shows that many children who experienced the 1995 Great Hanshin Earthquake, which claimed 6,500 lives, suffered from Post-Traumatic Stress Disorder (PTSD) after three, five, or even 12 years. “Kids in Fukushima have already shown some signs that could be related to PTSD. Some schools have seen violence increase among their students. Small children are very sensitive to their parents moods,” said Shishido reasserting the importance of an effective support system. Shishido acknowledges that disasters have manifested elsewhere in Asia, but children’s responses vary from place to place. He is presently a representative of the Asian Education Friendship Association, which builds schools in Laos and Vietnam. “In Laos, about 200 people are killed every year by cluster bombs left from the Vietnam War. In a small Vietnamese village, people are forced to drink dioxin-tainted well water. But surprisingly, those children have sparkly vibrant eyes. I always wondered why,” said Shishido. 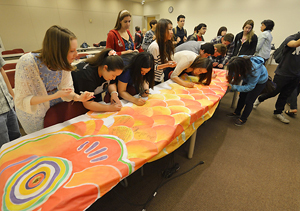 Shishido wants to bring the sparkles back to the eyes of children in Fukushima as well. And to do so, he strongly believes in the importance of traveling classrooms, which would enable Fukushima kids to become more independent and to engage with nature. Since 2012, fifth and sixth graders from all 21 schools in Date city have experienced traveling classrooms. Date city superintendent Yuda and Shishido have lobbied to adopt the program, and as a result, Fukushima’s prefectural government has appropriated a budget of three million dollars this year for traveling classrooms. Shishido says the program still needs adjustments before it can be adopted widely, so he will continue to work hard to bring smiles and education to children in Fukushima. So far, he has visited 25 locations in Japan to share his experiences and has recognized that the memories of the disaster are fading away for people who live outside of Fukushima and Tohoku area. “There are many crucial lessons that we learn from this crisis,” Shishido promised to keep sending voices and messages from Fukushima to the world. U.g. Kaneko and his wife Beverly Findlay, members of Families for Safe Energy, organized Shishido’s speaking tour to bring the voices of Fukushima to the U.S. “The Abe administration has been acting as if nuclear disaster had never happened, so I felt a sense of responsibility to spread the truth,” Kaneko said. He also thinks that Shishido’s approach to protect children in Fukushima as an educator is very clever. “It’s important to voice Fukushima’s danger and anti-nuclear power plants, but blunt warnings could make some people turn away,” said Kaneko. 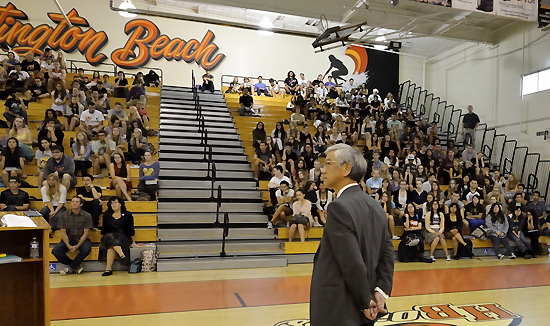 During his tour of Southern California and Arizona tour, Shishido addressed approximately 500 audience members across a total of six locations including middle schools, high schools, and a college.